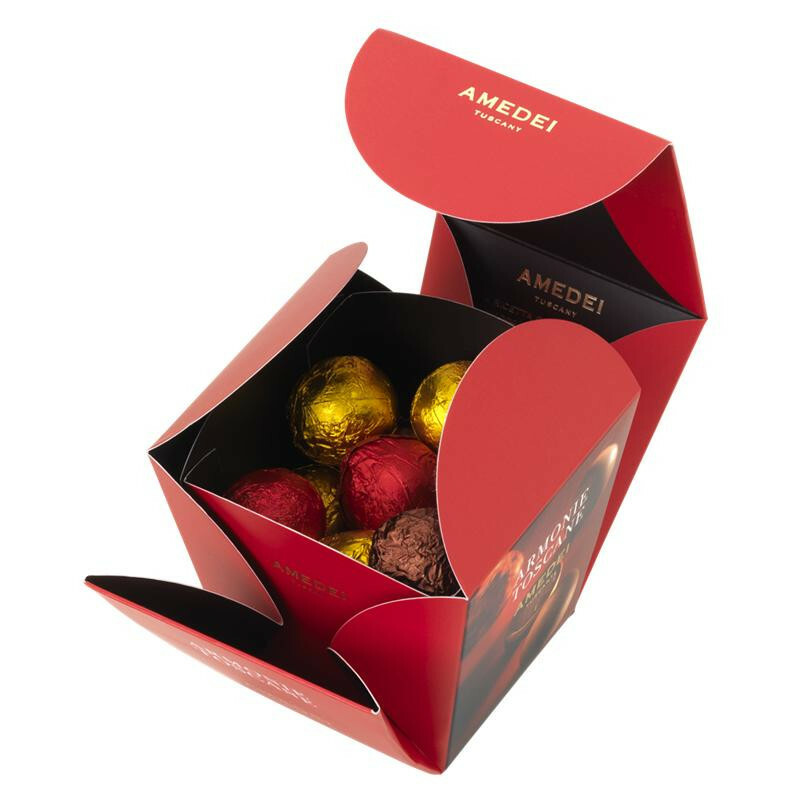 Amedei Chocolate Pralines Armonie Toscane, 12 piece, has a mix of 3 pralines in milk, white milk, and dark chocolate. This box contains following pralines: twelve delicious chocolate creations, kept in a box that opens with the grace of a flower. An exquisite way to discover a new tradition, in three different flavors: milk chocolate filled with gianduja filling, dark chocolate filled with almond filling, white chocolate filled with hazelnut filling. External Ingredients: dark chocolate (cocoa mass, cane sugar, cocoa butter, vanilla. Cocoa min. 66%); milk chocolate (cane sugar, cocoa butter, whole milk powder, cocoa mass, vanilla. Cocoa min. 32%); white milk chocolate (cane sugar, cocoa butter, whole milk powder, vanilla. Cocoa min. 29%). Internal Ingredients: cane sugar, whole milk powder, hazelnuts Tonda Gentile Trilobata, cocoa butter, skimmed milk powder, dextrose, almonds, pistachios, anhydrous cow's butter, cocoa mass, vanilla, natural flavors. May contain traces of walnut.